Grimm has done a fine job of filling out the Wesen world. Be it through the introduction of different types of creatures, a look at the ways they go about their intra-species hierarchy, or revealing all the ways that they’ve infiltrated “normal life” through their career choices and various ambitions, the show has made a system of clashing subcultures of animal-people something fairly tangible and grounded in real life. 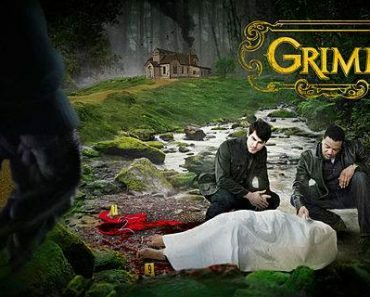 Don’t get me wrong, the show is quite fantastical and appropriately supernatural; it’s just that, nearly 30 episodes into its run, Grimm has managed to underline its theme (human duality) fairly well while making the Wesen world feel like, well, a world. But now that it’s been established as almost a living, breathing organism, what happens when something hits the all-powerful Wesen and weakens them? It was a pretty sick (har har) episode of Grimm, as the case of the week sprang from multiple infected Wesen that had been stricken with some type of strange disease. After a local Parks & Recreation employee (and porcupine-like Wesen) gets rear-ended by one of the infected, a sore-covered, aggressive zombie-like shell of a person, he accidentally pricks it with one of his quills, becoming infected himself. The disease, known as fluvus pestilentia (or the yellow plague, an ebola-like virus known to hit Wesen especially hard), is spread through scratches/pricks/blood contact and initially causes the recipient to become “love drunk” and acquire an increased libido. After that, however, they become bed-ridden and, without being properly tied down/secured beforehand, dangerous to others; Patient Zero, a man named Carl Stanton (also a reinigen, a rat-like Wesen) that had recently moved to Portland from Washington, was eventually gunned down by Nick and Hank after fleeing the scene of the initial traffic accident and charging at them. His wife, also infected, is “put down” by Wu after attacking him when he comes to her home to question her and the Parks department employee is on the receiving end of a medicinal aide concocted by Monroe, returning him to his normal state. Another infectee was Rosalee, who was scratched on the neck by the Parks employee (Ryan Gilko) during a picnic in the woods with Monroe. 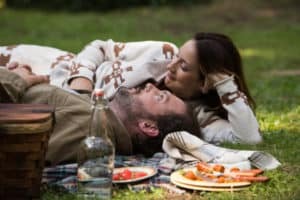 The two had finally decided to act on their feelings for one another and obvious chemistry by taking Monroe’s antique picnic basket (ha) that had been in his family for years and making a day of it. The birds, the flirty conversation, the fresh air – the two tend to spend their time indoors and to be able to get out of the sometimes stifling four walls might’ve been the thing they needed. Key word: might’ve, since right as they were about to kiss, Gilko, who arrived after them in his lime green truck, ambushed them and chased them all the way back to Monroe’s Bug and down the road back to the main highway. Upon returning back from their picnic, the two get a little frisky in the spice shop, but once they find out about Rosalee’s scratch (and Gilko’s collapse when Nick and Hank arrive out in the woods to apprehend him) things escalate pretty quickly. 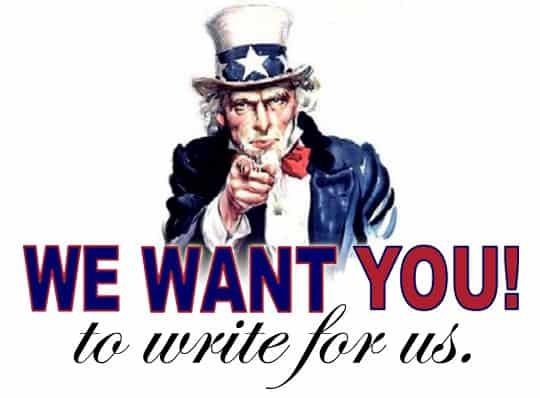 It doesn’t take long before Monroe, ever the bull in a china shop, is bent over mixing ingredients for a cure to the plague, Nick in a back alley having to reel in a suddenly mobile (and dangerous) Rosalee and Hank handcuffing Gilko and tending to Rosalee once Nick disarms her and brings her back to be treated. 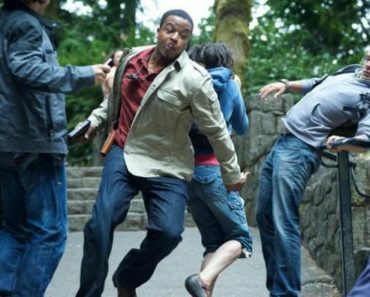 Luckily, everything works out – the last of the plague has been stomped out, Monroe and Rosalee have finally confronted their feelings, and nobody else had to be hurt/put down in the process. Last week, Hank became clued in on the fact that he wasn’t the only one that can see creatures – Nick has the ability, too, which brought a lot of comfort for the increasingly paranoid officer. 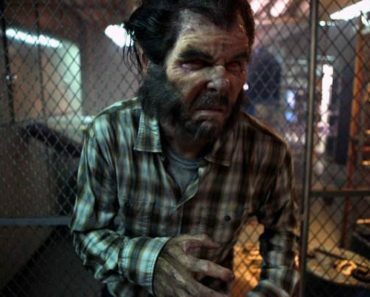 “Quill” found Hank getting more integrated into the Wesen world, having been informed in more detail about Nick’s ancestry, what exactly he can do, and what these creatures actually, well, are. Once again, Hank didn’t run, nor did he back down from his initial (oddly touching) support of Nick. Rather, he stood his ground and appeared to kind of relish the new knowledge; after being in the dark about what was going on for so long, I’m sure he appreciates having the answers that he had been fumbling around to find. Hank’s a very direct, pragmatic type of thinker; he sees a problem, he solves it. Things are good or they’re bad. There’s right and there’s wrong. For quite a while, he knew there was a problem and he didn’t know how to solve it, so at least now, he knows what’s going on and can address it accordingly. In addition to some perfunctory knowledge about everything that had been happening under his nose, Hank found out that both Monroe and Rosalee are Wesen, though he took the news in stride and administered the medicine that helped bring the latter back from the brink. Although, the fact that there were two bowls of liquid and Rosalee drank from a different bowl than Gilko might make her recovery go a little differently, no? Captain Renard, ever the enigma, just got a little more mysterious. Not possible, you say? Well, the currently pure-of-heart police captain/Wesen royal received a phone call from someone in his family palace that another reaper had been sent to Portland. Last season, multiple reapers were sent from Germany to try and take out an increasingly powerful Nick, but he managed to take all of them out and sent their heads back as a symbol of his prowess. This time, the reaper comes from Rome, connecting through JFK and stealing a cab once he arrives in Portland. But what’s his agenda? 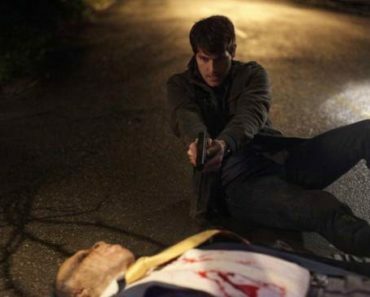 Is he purely going after Nick, or is Renard’s family going to try and have their black sheep meet an “accidental” end? From what little we saw of the creature in “Quill”, who looked vaguely equine in nature, he’s on Nick’s trail, the final shot of the episode finding him peering into the spice shop at Monroe and Rosalee as they shared a moment. Curiously, he had ample opportunity to do major damage, considering Rosalee’s illness, and he failed to take action. That type of deliberate planning makes me think that he has more on his mind than a quick bout of violence with the world famous Grimm and that the group has a new predator that they’re going to have to watch out for. While everyone else was battling fever dreams, Juliette was trying to wake up, her memory of Nick still showing no signs of returning. Everything about their house gives her flashes to past events, but no matter how many of his shirts she sniffs or how many times she talks to Monroe, Juliette has a big gray spot where the memory of her relationship with Nick should be. For now, it’s okay, but the longer she goes being in the dark, the more distant she’ll grow from Nick and what’s left of their relationship will inevitably fall by the waste side. Juliette did, however, invite Bud the repairman (his first appearance last season and curious talk the initial inclination that Nick might be hiding something from her) over to question him about her relationship with Nick. 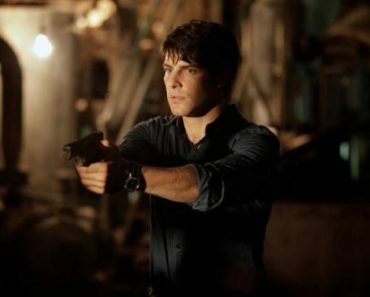 He, of course, gushes about the two, thanks to his admiration of Nick, but he does make one major faux pas – he refers to Nick being a Grimm and has to quickly backtrack. Juliette already feels alone in the house anyway, so hearing that her boyfriend is something that she doesn’t understand (and doesn’t remember from their final conversation pre-coma) may increase the tension between the two and eventually push him away once and for all. Nick needs to have Juliette in his life, if only due to her being one of the remaining vestiges of his humanity, but unless he can put out the Grimm fire started by Bud and find a way to restore her full memory, he might be going at it alone. -Can we talk about the fact that a magical cat is now roaming the streets of Portland and nobody seemed to notice and/or care? -I think that was the first time the medical examiner made an appearance this season. I actually kind of missed her. -Nick’s whole “you’re only seeing them (the creatures) because you have a Grimm partner” to Hank was really interesting. I’m expecting there to come a time when Hank has to choose – does he want his sanity or does he want his friendship/partnership with Nick? -Monroe’s reaction to being told that Hank knew was fantastic. -Renard’s still reading about Nick’s parents. 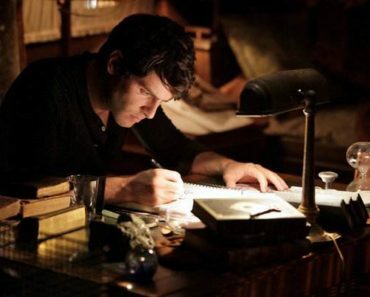 Will he drive himself mad thinking about the second Grimm? -When Grimm returns on Friday, September 28th at 9:00, Monroe goes undercover at a Wesen church and Nick continues adjusting to Juliette’s memory loss.